My fascination with generational wonton makers continues with a visit to MaxNoodle House. I had spotted this eatery on my visit to Michigan Noodle Restaurant and what actually caught my eye was MaxNoodle’s Chinese name. It’s nearly identical to the famous Mak’s in Hong Kong (the pic of Mak’s in Hong Kong is courtesy of Google Street Map). In all likely hood there’s no relationship at all between the two but I was definitely curious. As I entered the eatery I realized I’ve been here before. However it was many years ago when it was called McNoodle. I ordered a bowl wonton noodles and plate of taro root & pork spring rolls. Much like my previous visits to McKims and Michigan, the wontons and overall noodle bowl are smaller in proportions at MaxNoodles than say the Congee Noodle franchises. 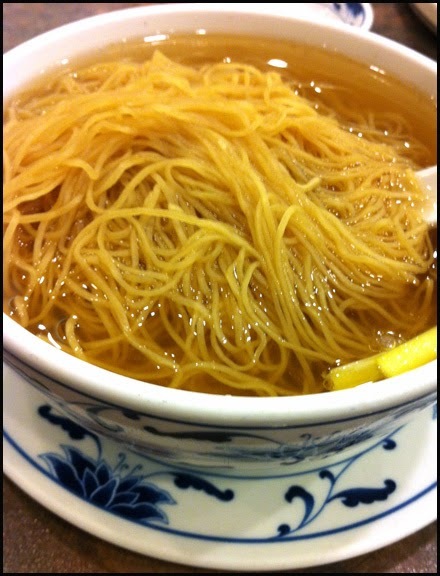 Despite its petite size, this bowl of noodles packed a satisfying and comforting punch. The wontons were bite sized. The filling was the best out of all the generational wontons makers I have tried. The shrimp were whole and had nice firm texture. The mixture was fairly compact and cohesive. 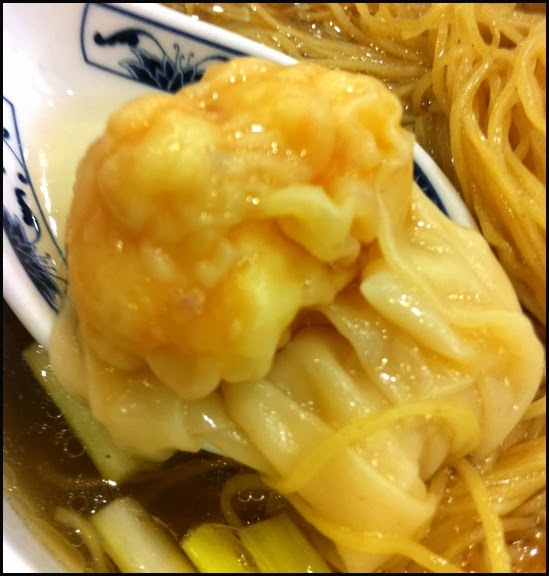 This probably contributed to the potent seafood savoriness in each wonton. These were excellent wontons. I thought the noodles served here seemed thinner. They had an excellent chewy texture to them. The soup was flavourful, complex but not overwhelming. I find that with the superior broths used at other restaurants, there’s usually a very dominant flavor that standouts, whether it’s ginger, pepper or seafood fishiness. However with Mak’s soup, I felt the flavours were more harmonious and as result there were no sharp flavours jutting out. In my hunger induced haze, I forgot to ask for my typical green leafy vegetable side. Apparently when I become super hungry, healthy eating goes out the window and deep fried spring rolls takes its place. 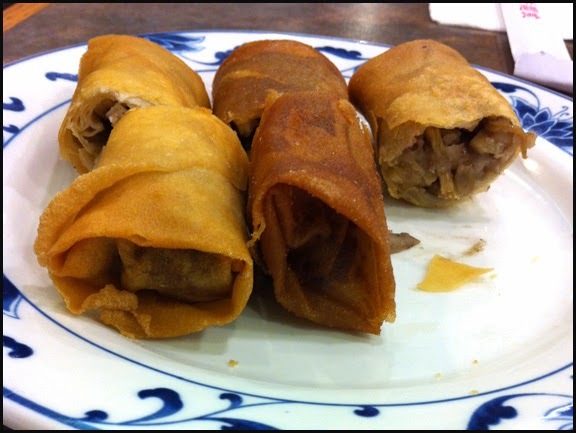 I had to order the pork and taro spring roll filling, simply because it’s unusual and well I like taro. When prepared properly, taro root has a subtle sweet fragrant flavor and a nice fluffy texture. For the most part the taro exhibited the soft texture and had its characteristic aromatic flavor. In addition to the purplish tuber, there were bamboo shoots which provided a crunchiness and slivers of pork (in one of the rolls, the pork pieces were quite dry). A savory sauce helped provide some moisture to the filling. I was expecting a somewhat oily affair since one of the spring roll looked over fried. However all the spring rolls were not that greasy. These crunchy appetizers were not earth shattering but were tasty and executed fairly well. Out of all the generational wonton makers, I feel MaxNoodle’s wonton soup is the best one so far. The execution, taste and texture of their wontons and the balanced superior stock make it better than its competition. In fact, if the quality I experienced on this visit is replicated over a few future visits, MaxNoodle may become my new favourite wonton house in Greater Vancouver. PS: When I was grabbing the screen shot of Mak’s in Hong Kong on Google Map, I couldn’t help but whirl the camera angle to see what the atmosphere was like around Mak’s. As I did, I spotted another restaurant in Hong Kong that has a doppelganger here in Richmond. It seems that when a vast ocean separates you, trademarks don’t matter. None the less, thanks to this discovery, I may have my next destination for my wonton mein saga.